Hi everyone! 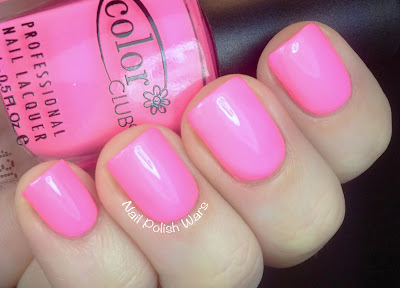 I'm so excited to show you a couple of awesome Color Club shades today! Flamingo is a bold and sassy pink creme. It is so vibrant that it almost glows!! The formula for this one is a little on the thin side, but builds up easily. To be honest, I wasn't too crazy about this one when I saw the bottle, but I flipped for it when I saw it on the nail! Shown is three coats of Flamingo. Wild Cactus is a fun muted green creme. The formula was smooth and easy to apply. I really like this one a lot. It's a great green that isn't too bright, which is sometimes a challenge. Shown is two coats of Wild Cactus. I really hope you enjoyed the Color Club spam today! You can find Color Club polishes here, and be sure to like them on Facebook to stay up to date on all of their new collections and promotions!!! Awesome! I love them both!